The following are the most frequently asked questions about auto detailing services. Auto detailing is probably the best and most valuable maintenance program for your vehicle. Car detailing is an important single process that covers a wide variety of techniques and products which, to get the best results, require considerable skill to apply. It is considered an efficient renovation and protection of the various surfaces of a vehicle to keep it working in good condition. ﻿More information. As we are mobile, we can do our auto detailing at your home or office, as long as our work space is not inhibited by such things as low hanging tree branches, parked cars or anything else that would limit our access to our van or to your vehicle. Our unit is completely self-contained - we bring our own water, power and supplies - there are no hidden costs. And with our Eco-Friendly auto detailing system, you don't have to worry about anything harming your environment. Is steam better than soap and water? Yes. Below are just some of the reasons. A FULL DETAIL, typically requires 6 hours, while an INTERIOR or EXTERIOR ONLY DETAIL requires only around 4-5 hours. Please allow more time for pickup trucks and SUVs. We will give you a better timeframe once we complete your pre-cleaning checklist. At least once per year. Detailing has proven to be effective in getting you a better resale/trade-in price. So, if you are planning on selling/trading your car, make sure to have it detailed within a week of selling/trading it. It is usually when selling a vehicle that most people consider detailing. But, by that time (an average of 5 years) the vehicle has too much wear and tear to restore it to a like new condition. That's why we urge our customers to think of auto detailing as a maintenance program the same as changing the fluids, getting a tune-up or rotating the tires. Most people don't realize that in most cases, it is less expensive to replace the engine than to replace a "factory paint job"! We recommend at least 2 to 5 times a year depending on your driving and car washing habits and how you store your vehicle. Is it parked inside or outside most of the time? Do you wash it every other day or maybe only once a month? How do you wash it? Do you spend so much time in your vehicle that you feel like it's your home? These are just some of the determining factors that we consider in recommending what maintenance schedule is best for you. When is the most critical time to get my car detailed? Don't forget the winter months are the most crucial time to detail due to the rapid changes in temperature, road construction, salt and other elements that are especially hard on your vehicles exterior. Not to mention that the Magnesium Chloride they are using on the roads these days is proving to be even more harmful than we thought to the exposed surfaces of your car. While it's easy to rationalize that "it's just going to get dirty again anyway", properly applied sealant is your only defense! Plus it makes it easier to wash off all that harmful grime. We do auto detailing in the Oklahoma City area, generally within 25 miles of Yukon, OK.
Do I have to sign a service agreement? No. However, for the protection of all parties, we do require you to sign our pre-cleaning checklist. This checklist points out problem areas of your vehicle, such as a tear or loose/chipping paint. Yes, we would be glad to design a program to meet your specific requirements. We accept Visa, MasterCard, American Express, Discover and Cash - no Checks accepted. Yes, after your first detailing, we would be glad to design an auto detailing Maintenance Plan specifically for your vehicle. What if it rains right after you detail my car? We monitor the weather daily with N.O.A.A. and if there is inclement weather in the forcast, we will contact you and give you the opportunity to re-schedule. During this season, we schedule appointments from 8:00- 5:30 pm Tuesday through Saturday. However, we do not schedule FULL DETAILs after 10:30 a.m.
No. All of our cleaners and dressings are eco-friendly. Can you remove bad odors from my car? In most cases yes. See more info. Are you insured for any damages caused by you or your equipment? Dix Auto Detailing is fully insured for any damage caused by its workmanship or cleaning materials/equipment. Our cleaning materials are Eco Friendly meaning non-toxic, biodegradable, no bleaches or chlorine. We are extremely careful with our customer's property. 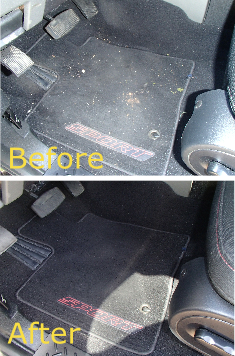 We perform a pre-cleaning inspection of the entire vehicle which highlights any pre-existing problem areas (i.e. tears; worn areas; stains which have discolored fabrics, leather or vinyl; dents, scratches, cracked or damaged glass. We review the inspection form with the customer and have them sign the form. You can book online or call us. When you know you will be delayed, please ﻿call us﻿ as we may be able to accomodate you, depending on our schedule any given day. If you are more than 10 minutes late without phoning us, we will consider your appointment a no-show. Please note there will be an additional fee of $25 for re-scheduling a no-show appointment. What happens if I need to re-schedule my appointment or I forget my appointment? Appointments may be re-scheduled online wth at least 12 hours of notice. We send reminders to all appointments the day before, as well as sending you a text message an hour prior to your appointment. Please note there will be an additional fee of $25 for re-scheduling a no-show appointment. At least 24 hours is required to cancel an appointment online. However, if you know you cannot make your appointment, that you need to cancel, please ﻿call﻿ and let us know. Please note there will be an additional fee of $25 for re-scheduling a no-show appointment.